外黒人 is a spiritual rags to riches adventure. I have been blessed to live a ‘storybook life’ but not in any glamorous way. Writing this book has allowed me to examine my role as a person of color—which I refer to as ‘melanin-rich’—in a society which has proven itself to be hostile toward non-Caucasian people. Because this is part memoir, part historical treatise, and part survivor’s guide, it is my intention to stretch the parameters of a conventional novel. In Japanese, the word Gai-koku-jin, literally meaning outside-country-person; i.e., foreigner, is traditionally written as「外国人」. I, however, am coining terminology by replacing the middle character with「黒」, which is pronounced identically but means ‘black’ instead of country. Not only does this symbolize my own cultural perspective, but it also represents a set of circumstances which is not limited to any race or country. Book 1 of this trilogy is told through the eyes of a confused child. A stranger in my own home, like so many neglected children, I found a surrogate family in the street—mainly at our neighborhood basketball courts. After learning how to ‘make a dollar out of fifteen cents,’ I was headed down a tried-and-true path for disaster until, ironically, a Beast and a Serpent came to my rescue. 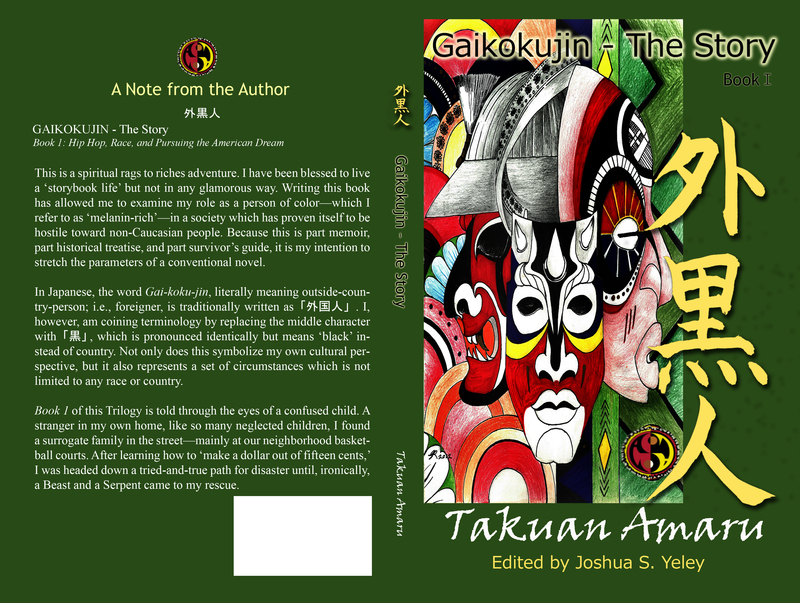 Gaikokujin - The Story is part memoir, part historical treatise, and part survivor’s guide, it's designed to blow your mind on more than one level.